While Marta Beast was at the dog spa last week (amusing before and after pictures coming soon), I headed over to my favorite junk mall to hunt away the hours. I managed to find all sorts of vintage treasures, including a few pieces of furniture for the new house (which Joe swears we're moving into next fall): two funky, yet surprisingly comfortable old chairs I couldn't resist for $3 apiece; an industrial looking, square metal cabinet with an indestructible formica-type worktop that I know will come in really handy somewhere; a darling little dark wood table with four tiny drawers that might become a nightstand; a rustic wooden footstool that makes me think of those stately old summer camps in the Adirondacks; and a cheerful painted yellow dresser that has glass knobs, a stylish curve to the drawer fronts, and isn't as big as I would have liked but couldn't be passed up for 30 bucks. I still have to go back and pick up the bigger pieces, since the entire bed of the truck was filled with Joe's custom built Marta Cage, but I did manage to cram the little four-drawer table, the footstool, several boxes of small stuff, and this fun quilt into the passenger seat area and the extended cab (I love that extended cab). After many years spent buying and selling 1920's—1950's antiques and collectibles in California, it took me a while to get out of that buy, buy, buy mindset when I quit the business and moved to Missouri in 1994. But there weren't any of the big outdoor flea markets like the ones I'd loved going to in the San Francisco Bay Area, and strolls through antique malls often found me thinking, "I have neater stuff than this packed away in boxes at home." I began collecting heart shaped rocks and bird nests I found around the farm instead. But sometime last year, the treasure hunting bug bit me again, and I found myself venturing into a couple of what I call junk malls, where you might see a 1930's rolling pin and a gorgeous set of Art Deco drinking glasses in one booth and a barely worn $4.99 jean jacket from The Gap in the next. My kind of place. I still love using old things (it's so environmentally friendly, too), but my vintage tastes have changed, and these days I'm more likely to buy bakelite flatware I can eat with and use as food photo props than bakelite radios I can sell for big bucks or yet another piece of bakelite jewelry I'll never wear (though I do love looking at it). I still have numerous boxes filled with treasures I don't have room to display anywhere: my lucite purse collection, several Kit Kat Clocks in their original boxes (you know, the silly ones with the big moving eyes and wagging tails), dozens of Art Deco clocks and radios (though I do have a few radios on display in my cluttered studio—click here and scroll down to see them and read more about the things I surround myself with), lots of beautiful old pottery. And then there are those ViewMaster viewers and reels. Hey, at least the toy space gun collection was sold (oh, was it neat). My new buying rule is that everything has to be put to good use—or at least on immediate display. It also has to be cheap. A wooden 7-Up crate will hold bottles of homebrewed beer, the $2 thick white china mug that feels so good in your hand is already sitting on the laundry utility sink holding a little scrub brush, and the white Fire-King bakeware with the sweet blue flowers (four matching pieces for $15) will go beautifully from oven to photo shoot. 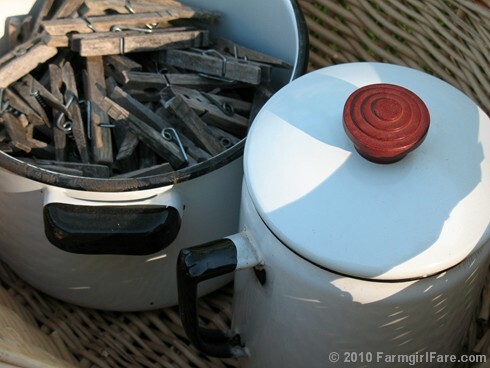 I've become enamored with vintage enamelware, which has to be one of the most practical things you can buy, whether you use it as it was originally intended or repurpose it for something else—like a coffee pot that holds clothespins. Battered old pieces work great in the garden. In all my years of antiquing, I somehow never noticed the stuff, and now I have it all over the place. And then there are the quilts. Just a few so far (see the 'more vintage' links below for a look at them), and almost always at least one on the bed. 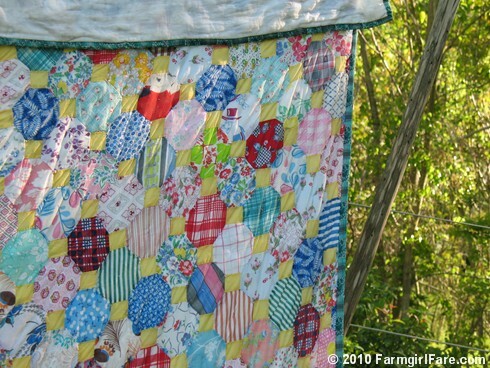 I'm drawn to what I think of as more utilitarian quilts, not real fancy, often partly made from feed or flour sacks. 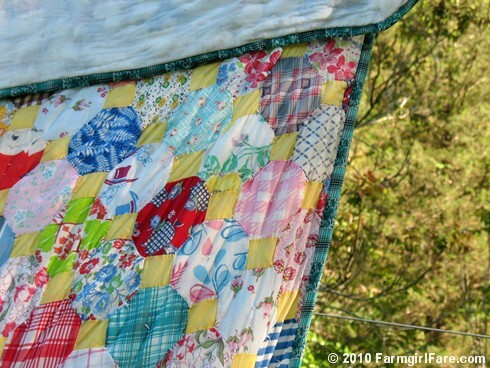 I don't know what the official 'rules' are for judging an old quilt's value—complicated patterns vs. simpler ones, types of stitching and finishing, fabrics used—but I do have my own criteria. 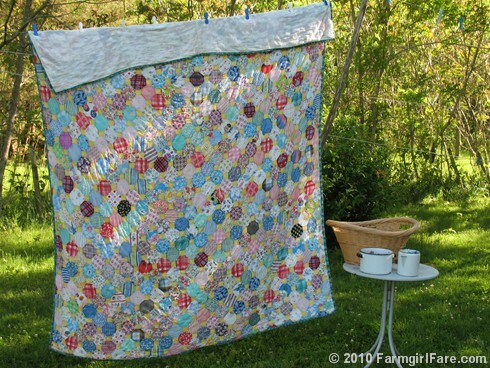 I only buy quilts that I plan to use, so while a quilt doesn't have to be in perfect condition (none of mine are), it does have to be able to survive being washed (I love the special handwash setting on my washing machine). It also can't be too expensive, and it has to make me happy whenever I look at it. This one passed with flying colors. Do you love to find and use vintage treasures, too? 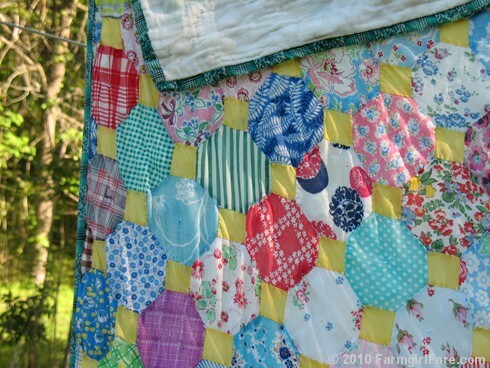 © Copyright 2010 FarmgirlFare.com, the handsewn foodie farm blog where it's been so much fun admiring all the different fabrics used in this quilt. If you look closely in the fourth photo, you can even see an upside down rabbit in a hat. Great finds! The photos are superb! I am off to Brimfield, MA, today for biggest antique show in New England--thousands of booths out in the fields...and tens of thousands of shoppers. Your rules for buying are similar to mine. We use our Bakeltie handled ladles & spoons every day. We use everything we buy. Hope I am as lucky as you were shopping! Susan - enjoying your explanation of reasons for and joy from your purchases. Delighted to read you also like the pieced goods quilts - made from what people had worn out or simply already had. I prefer true crazy quilts - not all the fancy elaborate patterns from all new material. But something I can look at and think - bet that was a first day of school dress, a work shirt,pretty frock for church. Bless you girl - I'm with Joe on the new house this fall! Our house is so stuffed with "vintage treasures" (meaning all the old family stuff), that I don't buy anything. That kind of makes me sad, because I would love to be able to buy some china of my own, but I really can't justify it when we have about ten sets overflowing every cupboard we have. Listen to me whining about having TOO MANY antiques. Shut up, Kristin. As a southwest Missourian I want to know where you shop. I will travel for some good shopping. Seems in the Springfield area, most of the prices are a tad inflated. So going to flea markets isn't as much fun as it could be. Enjoy seeing your finds! Sounds like you hit the jackpot!! I love the quilt. 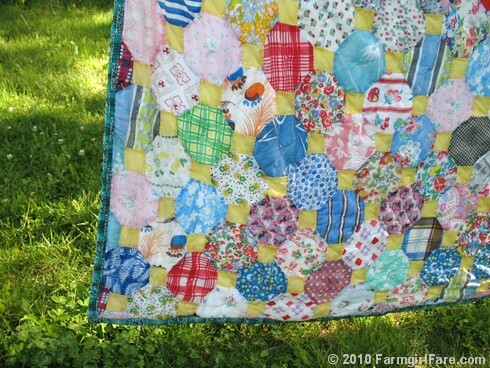 Gorgeous, lovely quilt! I enjoyed reading this post, and about your adventures! I grew up in a house that was stuffed with treasures. It took me years to spread those things amongst the relatives and gain some living space (I inherited the house). Now my rule for collection is that it has to be small. And when people go on trips and ask what they can bring me, I always say "a rock, a small rock." I use the rocks in the flowerpots for my houseplants, to keep the cats from digging the dirt. And every little rock has the name of its origin written in Sharpie. You turned me on to heart shaped rocks--now I have so many that I only collect them on important times (when we scattered our dog's ashes, for instance, we brought one home from that trip to the Gasconade). I'm so happy to read this post. I just said to a friend who helped me move some things, "It took a fancy hutch and some organizing but my apartment looks like it walked out of a thrift store"
I fall in love with things on their own merit regardless of any kind of theme I may or may not have going. I recently bought an entire set of china, circa 1950, service for 14, and an old hutch cabinet. It's all fabulous! The hutch doesn't match a single stick of furniture and the dishes are entirely too fancy. But it is love. happy hunting! Enjoyed your post. Visiting your site through A Way to Garden and am loving it. I love all things farm-related and then this post...just lovely. My mom is a quilter and has passed on a real appreciation of this art form to me. Love the quilt -- we are lucky to have some needlework pieces, linens and laces, from my great-grandmother and I love having them on the tables and bookshelves with family pictures displayed on them -- it gives me a real sense of continuity, and appreciation for her hard work and creativity! 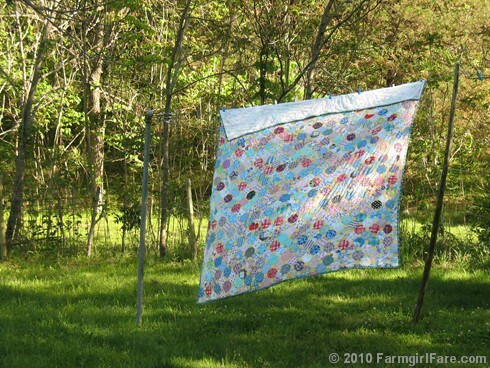 What a gorgeous old quilt! My grandmother made several in that same pattern, and I still use them. 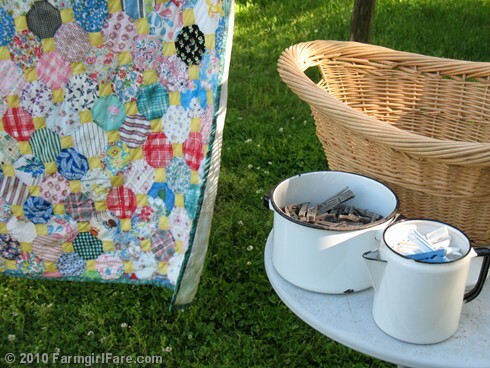 well you already know my love for vintage quilts and aprons too : ) i love your use or the enamelware for clothespins, such a beautiful idea! I look forward to your next wash! Our new (old) farmhouse is dying for a beautification facelift. So far, we've only got as far as the bathroom, but we've decided to keep it "country". I'm inspired by your list of things you buy and the rules around it. We don't yet have a single shelf available for anything "pretty", and I've got boxes and boxes of stuff to go through that I'll never use..a million books, etc. But I can't wait till we get to the decorating part. That will be so much fun!